Shiny Pichu Spikyeared in game: 38 Who? Important notice! Pokemon Shiny Pichu Spikyeared is a fictional character of humans. Pichu (Japanese: ピチュー Pichu) is an Electric-type baby Pokémon introduced in Generation II. It evolves into Pikachu when leveled up with high friendship, which evolves into Raichu when exposed to a Thunder Stone. Pichu is a small, ground-dwelling rodent Pokémon with pale yellow fur. Its eartips, collar, and tail are black and angular. Pichu's pink cheek pouches can store small amounts of electricity, and its tiny nose looks like a dot. Pichu is classified as a quadruped, but it can walk easily on its hind legs. Pichu is a social Pokémon known for its playful and mischievous demeanor. It is usually found in groups and often touch tails with other Pichu as a show of courage, composing a shower of sparks that can make them cry. It is inept at storing electricity, and may discharge if amused, startled, or subjected to shock. However, it cannot discharge without being shocked itself. Charging up is more easily done on days of dryness or thunderclouds. The crackling of static electricity generated by Pichu is audible. It can zap an adult human, but will surprise itself if it does. Pichu primarily lives in the forest, though it has also been depicted to thrive in urban areas. The Pichu Brothers are a pair of Pichu who have appeared in several places, including Pikachu & Pichu, Camp Pikachu, several episodes of Pokémon Chronicles, and the Pokémon Channel special Pichu Bros. in Party Panic. Their design is similar to that of Ash's Pikachu and Sparky, in that one has a scruff of fur while the other does not. 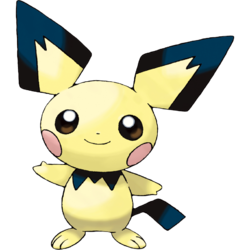 A Pichu with a spiked ear, known as Spiky-eared Pichu, appeared in the movie Arceus and the Jewel of Life; she helped Pikachu and Piplup find the keys for the jail cell that held Ash, Dawn, Brock, and Damos. 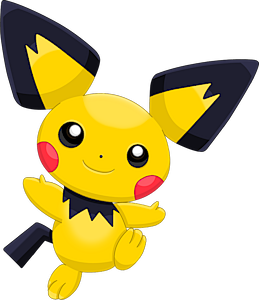 The Spiky-eared Pichu also appeared in Pikachu's Big Sparking Search, where she and Smoochum were preparing a birthday party for Bellossom. The Spiky-eared Pichu and a Pikachu-colored Pichu star in the fourth ending of the Diamond & Pearl series. Ukulele Pichu appeared in the Pokémon Ranger: Guardian Signs anime special, and was captured by Ben in the concluding part. Pichu first appeared in The Apple Corp. Many were stealing apples from Charmaine's apple orchard. 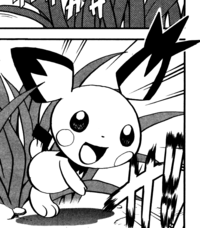 A Pichu had a role in Pokémon Mystery Dungeon: Team Go-Getters out of the Gate!. Pichu's big brother, Pikachu, was lost and he was so worried, the Baby Electric Mouse went out to find him. Pichu came across Team Meanies, but they played a horrible trick on Pichu when asked to join them. Pichu found Team Go-Getters, who gladly let him come along with them. Pichu was eventually kidnapped by the Skarmory that had kidnapped Pikachu. Another Pichu appeared in Pika and Goliath! under the ownership of Sho. A Pichu appeared in The Brockster Is In! with several other baby Pokémon. It was badly poisoned by a Tentacruel, but was healed by a Softboiled from Brock's Chansey. A Pichu appeared in A Jolting Switcheroo!, under the ownership of Lena, although it was cared for by Lyn. A Pichu appeared on a girl's shoulder briefly in Celebi: Voice of the Forest in a window during Ash's battle at the beginning of the movie. A Pichu appeared in Lucario and the Mystery of Mew as a transformation of Mew. A Pichu belonging to a Coordinator was used in the Appeals Round of the Kanto Grand Festival in May, We Harley Drew'd Ya!. Three Pichu appeared in Hungry For the Good Life!. Two Pichu appeared in Kalos, Where Dreams and Adventures Begin!. 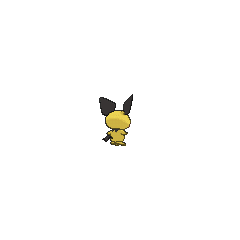 A Pichu appeared in To Find a Fairy Flower!. A Pichu appeared in Pikachu and the Pokémon Music Squad. A Trainer's Pichu appeared in Alola to New Adventure!. Three Trainers' Pichu appeared in SM006. Two Pichu appeared in SM012. EP179 Pichu Ash's Pokédex Pichu, the Tiny Mouse Pokémon. A pre-evolved form of Pikachu. Despite their size, Pichu release bursts of electricity that can shock even humans. However, Pichu are unskilled at controlling their electricity, and sometimes release it by accident when surprised, or when laughing and shock themselves. XY016 Pichu Serena's Pokédex Pichu, the Tiny Mouse Pokémon. The electric sacs on Pichu's cheeks are small. If it tries to store more electricity than they can hold, Pichu will shock itself. In Magical Pokémon Journey, it is revealed in The Accidental Treasure that Pikachu and Clefairy met as baby Pokémon, Pichu and Cleffa. Also, in The Miraculous Color of the Sky ~Best Friends~, Sandy and her Raichu are reincarnated as a little girl and a Pichu. 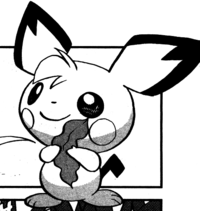 Pichu made a cameo in Teddiursa's Picnic in a fantasy of Professor Elm's explanation about Pokémon eggs to Gold. Gold, in his desperation, protected an Egg containing the offspring of Red's Pika and Yellow's Chuchu from the Masked Man. Soon thereafter, Gold's own talent as the "hatcher" allowed a powerful Pichu to hatch, with which he was able to defeat the villain and free Celebi from the GS Ball using Raikou's massive electrical power. Its name was unknown, though Yellow said, "It must have come from the day care where we left Pika and Chuchu!" She names it Pichu, deriving from its parents' names. It also returned with its parents to help destroy Guile Hideout's giant Kyogre monster with a Volt Tackle. In All About Arceus IX, a Spiky-eared Pichu accompanied Pibu on gathering herbs for Celebi to cure Giovanni's disease. After she and Pibu met up with Gold, Gold saw her and teased him about finding a date. In Pangoro Poses a Problem multiple Pichu were among the Electric-type Pokémon that charges the Prism Tower during a blackout. 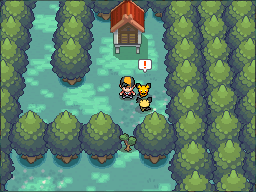 In Pokémon Gold and Silver: The Golden Boys, Gold receives an Egg from the Day-Care Couple in A Huge Mysterious Tree!!. It hatches into Pichu in The New Pokémon Is Hatched! !, becoming one of Gold's party members. Pokémon Stadium 2: Pichu stars in the mini-game "Pichu's Powerplant." Similar to Pikachu's and Voltorb's mini-game, "Thundering Dynamo", in Pokémon Stadium. The player has to be the first to charge up the most electrical power in order to win. Pokémon Pinball: Ruby & Sapphire: Pichu will assist Pikachu on Ball-Saver duty for 50 coins or as a prize in the slot machine. 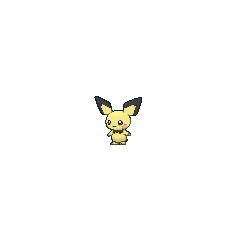 Pokémon HeartGold and SoulSilver: The Spiky-eared Pichu will appear at the Ilex Forest shrine if the player approaches it with the Pikachu-colored Pichu first in the party. (The event will still activate if the Pikachu-colored Pichu evolves.) She will be automatically caught, and cannot be traded outside of Pokémon HeartGold and SoulSilver or evolve. Pokémon Ranger: Guardian Signs: A Pichu is the player's partner. This Pichu plays the ukulele and has a special musical Poké Assist. Despite its small size, it can zap even adult humans. However, if it does so, it also surprises itself. It is unskilled at storing electric power. Any kind of shock causes it to discharge energy spontaneously. When Pichu plays with others, it may short out electricity with another Pichu, composing a shower of sparks. In that event, this Pokémon will begin crying, startled by the flash of sparks. It is still inept at retaining electricity. When it is startled, it discharges power accidentally. It gets better at holding power as it grows older. It plays with others by touching tails and setting off sparks. This appears to be a test of courage. It is not yet skilled at controlling electricity. If you take your eyes off it, it may shock itself. Despite this Pokémon's cute appearance, those who want to live with one should prepare to be on the receiving end of its electric jolts. Moves marked with a superscript game abbreviation can only be bred onto Pichu in that game. 51%-100% HP I can't store electricity very well yet! 26%-50% HP Oh, no! I only have half my HP! Level up I leveled up! Yay, happy! Pichu not only recharges the Styler, its cuteness is uplifting to others. Everybody in the Haunted Zone is a friend of Pichu's! Pichu likes to play the Attraction Tangrowth's Swing-Along. 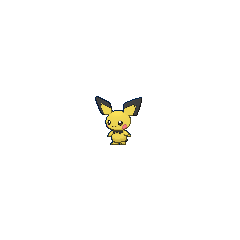 For other sprites and images, please see Pichu images on the Bulbagarden Archives. Pichu has the lowest base stat total of all Electric-type Pokémon. Pichu also has the lowest HP, Defense, and Special Attack base stats out of all Electric-type Pokémon. Pichu is the only Generation II Pokémon to be playable in the Super Smash Bros. series, though many others appear from Poké Balls. The Pikachu-colored Pichu (a Shiny Pichu) was the first Pokémon to be given out over Nintendo Wi-Fi Connection outside of Japan. Pichu used to be game director Junichi Masuda's favorite Pokémon. His new favorite is Victini. Pichu draws inspiration from mice, squirrels, and various other rodents. Pichu is a combination of ピカピカ pikapika (onomatopoeia for sparkle) and チューチュー chūchū (the sound of squeaking). It may also be a play on プチ puchi (petit). Pichu is ultimately a diminutive of Pikachu. Japanese ピチュウ Pichu From ピカピカ pikapika (onomatopoeia for sparkle), チューチュー chūchū (the sound of squeaking), and プチ puchi (petit). French Pichu Same as its Japanese name. Spanish Pichu Same as its Japanese name. German Pichu Same as its Japanese name. Italian Pichu Same as its Japanese name. Korean 피츄 Pichu Transliteration of its Japanese name. Cantonese Chinese 比超 Béichīu Transliteration of its Japanese name. The last character means super. Mandarin Chinese 皮丘 Píqiū Transliteration of its Japanese name.